Our Residential HVAC Services professionals are experts in the Air Conditioning Installation, Furnace Installation, HVAC Maintenance, A/C Repair, Furnace Repair, HVAC System Replacement / Upgrading of all brands of Residential Air Conditioning and Heating systems. Tired of your HVAC system conking out on you at the worst moments? With Charlotte no stranger to heat waves and cold spells, it is no wonder why a broken HVAC can wreak havoc on anyone's day especially if that system is powering an entire shop, office building or house. Fortunately, we have been operating in the Charlotte area for years and we install all major makes and models of virtually any type of AC system in your home, office or commercial space. With decades in the business, we have perfected the seamless installation of almost any kind of AC system out there, from the split type system common in condos to package units and even more complicated central AC systems for large commercial and industrial spaces. These systems are composed of external and internal parts. The external unit is placed outside the room and houses the condenser, the compressor and the expansion valve. The indoor unit contains the evaporator coil and the cooling fan and can be mounted almost anywhere in the house. They are often smaller and less bulky than traditional units and also have an aesthetic appeal that older models of ACs do not have. Package units are composed of all the parts including the cooling coils and the filters of the unit in one casing. These units are designed for spaces such as small homes, motels, and function halls. A variation of this design is one where the compressor and condenser are in one casing while expansion valves and cooling coils are in a separate casing located in the room to be heated or cooled. Heat pumps are central components of any AC system. We also offer installations of heat pumps whether you are replacing a broken pump or installing an entirely new system. Heat pumps are composed of two units, the outdoor unit or the heat pump and the indoor unit called the air handler. These are ductless systems that resemble central systems but are much smaller and suitable for cooling just one or two rooms. They are composed of an outdoor compressor and an indoor air handler. The two are linked together by a tube that contains the power cable, refrigerant tube, suction and condensate drain. These are very easy to install and energy-efficient since you can have multiple air handlers connected to one outdoor unit and you can condition each zone differently as needed. Peace of Mind – Automatic, periodic inspections, lubricating, adjusting and cleaning of your equipment keeps it running at peak, trouble-free efficiency. Potential problems are spotted before they can cause trouble. Priority Emergency Service – Should you have a breakdown, our own dispatched service technicians will respond to your call as a priority service call. We service our Preferred Service Policy customers first. Discount on Repairs – When you become Always Heat and Air Preferred Service Policy holder you are entitled to a 10% discount on labor and parts for repairs. Our technicians each have over 10 years of experience in HVAC industry, are EPA certified, background checked, drug tested, uniformed, professional, and honest. They will diagnose your system and provide you with a written estimate for repairs. In most cases they will have required replacement parts in their vehicles, and can perform repair on the spot. Call us today to schedule an appointment at (704) 453-4271. Same day appointments may be available. The Duct work in your home can be extensive and even more so in your place of employment. 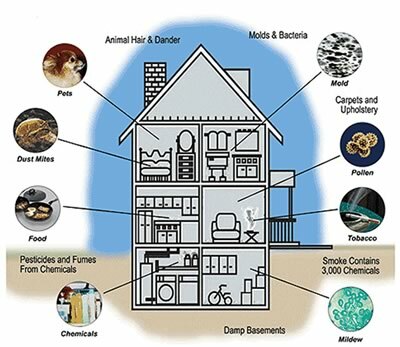 It's the perfect breeding place for all sorts of bacteria, pollutants, micro-allergens and other health hazards. Ducting Replacement is the only sure way to get rid of all of the irritating particles that are lurking inside. It's also the best way to make sure that the Duct system is in optimum condition and properly sealed to keep pollutants out. Start off with a clean slate with new, clean ducts. Air cleaners greatly improve the air quality by taking pollutants out of the air. Electronic Air Cleaners can be added to your HVAC system to trap the smallest of particles. They have advanced features. There are carbon filters to remove gas particles. Ultraviolet light is used for disinfecting the air. Breath better air with modern technology. Select a humidifier to keep the humidity at a comfortable level. Controlling the indoor humidity can prevent damage from static electricity. It can also prevent shrinking floor boards and keep wallpaper from peeling off the walls. With the right humidifier, it will take less energy to stay in your comfort zone. That means energy savings! Contact us now to discuss all of your air quality concerns and needs. We're here to help you breathe easier! Mauris placerat eleifend leo. Aenean fermentum, elit eget tincidunt conQuisque sit amet est et sapien ullamcorper pharetra. Praesent dapibus, neque id cursus faucibus, tortor neque egestas augue, eu vulputate magna eros eu erat.